Measuring the adhesion strength of coatings such as paint, glue, varnish etc., is necessary to ensure the coating has bonded well to the substrate and is performing satisfactory. A variety of adhesion testing methods are available to determine how well the coating is bonding to the solid substrate. The Cross Hatch Test Method is widely used to assess the adhesion of paint coatings and provides an instant assessment of the quality of the bond to the substrate. The cross hatch test is a visual comparison method for paint and powder coatings up to a thickness of 250µm (10mils) which is fast and easy to use. The coating is cut into small squares, thereby reducing lateral bonding, and the coating adhesion assessed against ISO 2409 and ASTM D 3359 or Corporate Standards. UK based Dyne Testing offers 3 versions of the cross hatch adhesion test method. Click on one of the items below to read more about the products. 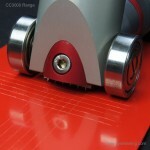 Cross Hatch Adhesion Test Kit – CC1000 provides an instant assessment of coating adhesion. Simple but effective method that can be used on a variety of substrates. The round cutting knife has eight cutting edges that can be changed easily by rotating the knife. 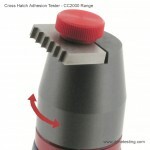 Cross Hatch Adhesion Test Kit – CC2000 A Basic kit with a single cutting knife. This simple kit will quickly determine the coating adhesion of a large variety of paints. The cross hatch cutter can be purchased separately also for those on a tight budgets. Cross Hatch Adhesion Test Kit with Guide Wheel – CC3000 Cross hatch cutter with a single cutting knife & wheel attached to ensure reproducible results. Comes in a handy kit & suitable for measuring coatings up to 250 µm thick. 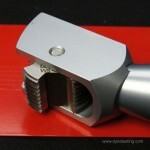 The cross hatch cutter can also be purchased separately if required.